The other day I bought a gigantic ham to bring to my inlaws for dinner. It fed five adults and two small dogs, and the rest was carved up and divided between the two households. We have been eating ham for DAYS ever since, sometimes lunch AND dinner. Piper has also been eating ham for every doggy dinner. When we finally got tired of fried ham, and ham sandwiches, and cheesy cauliflower casserole with ham, I made the chowder pictured below. Hoo boy, it is the perfect dish for the kind of weather we’ve been having in Ottawa lately. This chowder is creamy! It’s hearty! It contains SEVERAL FOOD GROUPS, and best of all, it uses two cups of leftover ham. Here’s the original recipe. It’s definitely a keeper and like many of these kinds of chowders and stews, tastes even better the next day. Maybe worth noting: I used frozen corn because I didn’t want to bother with shucking/extracting kernels from slippery cobs. I also used half the prescribed amount of sour cream and a dollop of light cream (5%) I had kicking around in the fridge. I topped my bowl with bacon and green onion. Mark topped his with bacon and cheddar cheese. It was delicious and immensely satisfying. 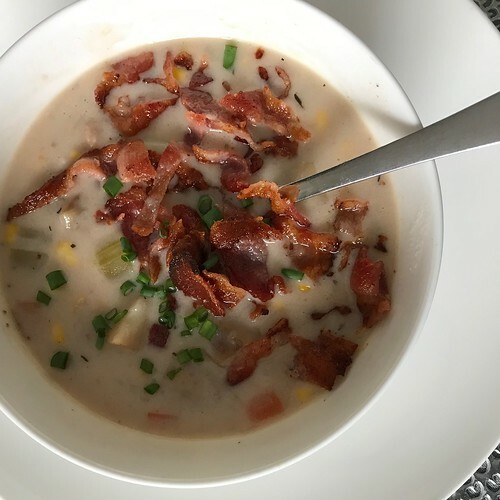 Share the post "You must MAKE THIS >> Ham and corn chowder"
1 Response to "You must MAKE THIS >> Ham and corn chowder"